More than 1 million Honor 9 had been shipped globally - Playfuldroid! Last month, Huawei took the wrap off their latest Honor 9 flagship which have since been selling off like hot cakes. Today, Honor’s CEO Zhao Ming has announced that the company has successfully shipped out more than 1 million Honor 9 globally in just 28 days, setting a brand new record for the company. 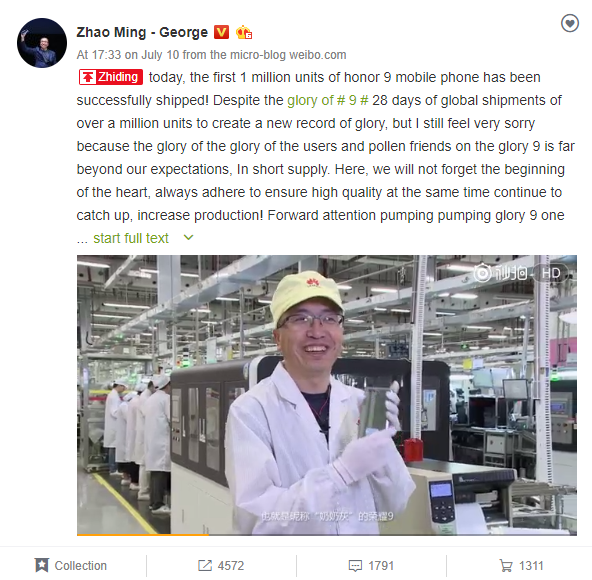 In the same Weibo post, he also apologize for the shortage in supply as the demand for their flagship greatly exceeded their initial estimations and added that the company will continue to work hard in increasing its production capacity without compromising on its quality. Other than the Asian markets, the Honor 9 is current available for purchase in most of the European markets including UK, Belgium, France, Germany, Italy, Spain, Portugal, Netherlands as well as Switzerland. Sad to say, there still any news of its availability in the US market although reports have claimed that the device will not be heading to US anytime soon.